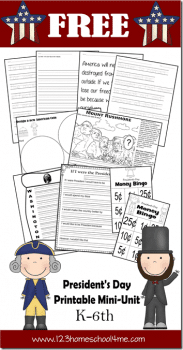 You are here: Home / Free Printables / FREE Presidents’ Day Teaching Materials! 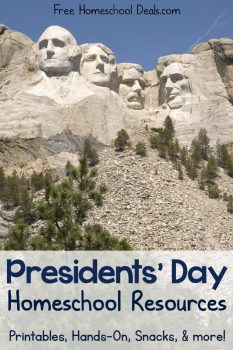 President’s Day is coming up 2/18! Be prepared with materials, ideas, and activities to celebrate in your homeschool! This holiday is a great way to discuss American History from its starting point and move into today’s political topics, depending on the age of your child. Use these materials to supplement your teaching and extend your children’s learning! This amazing unit study has all sorts of activities for geography, history, language arts, and more from FHD! 123 Homeschool 4 Me has 9 great coloring pages for your younger learners! 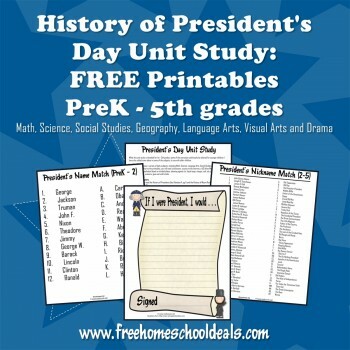 This unit study from 123 Homeschool 4 Me is perfect for grades K-6, and your kids will learn all about Abraham Lincoln and George Washington. There are videos, bingo games, craft ideas, and so much more! Check out this awesome compiled list of activities, recipes, readers, ‘I Spy’, and more! 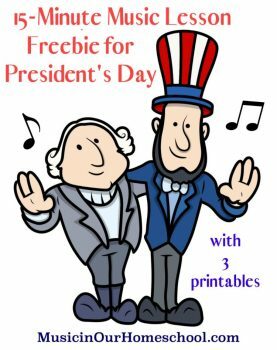 Enjoy this FREE 15-minute music lesson for Presidents Day! With this activity, your children will learn “Hail to the Chief” as well as a song to memorize the President names! It’s a fun way to introduce the presidents and get your children excited about it. (There are 3 pages included). 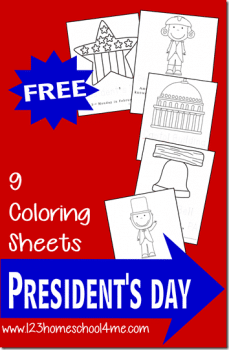 Click here for more Presidents’ Day Materials!